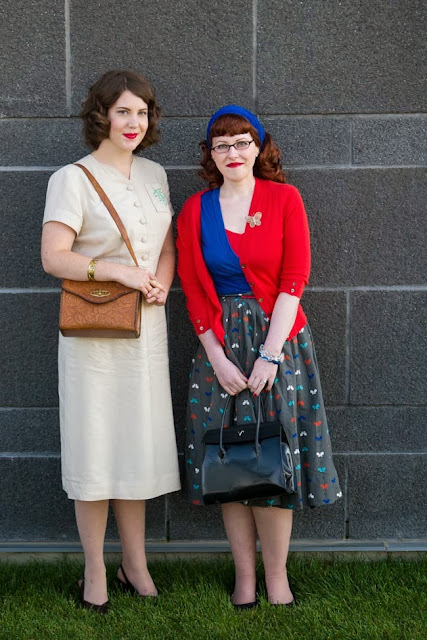 I was very excited to head down to Calgary earlier this month for a very special vintage blogger meet-up. Jessica of Chronically Vintage was visiting Calgary from her home in British Columbia, so I asked her if she'd mind if I popped down to meet her & her husband Tony - luckily for me, she didn't mind my hijacking of her holiday! We had a lovely day, having lunch and visiting vintage and antique stores, including the always wonderful A Vintage Affair. I was pleasant surprised that Bonnie, one of the owners, recognized me (we've done some messaging back and forth) and invited me back to check out their bridal collection. I can't wait! Despite finding some GORGEOUS things, nothing fit (I blame the giant rueben I devoured at Gruman's Deli) so I went home empty handed. Le sigh! I had such a fabulous time with Jessica and Tony - it was such a delight to meet them. They are both just so sweet and kind. Tony even took some outfit photos for me. 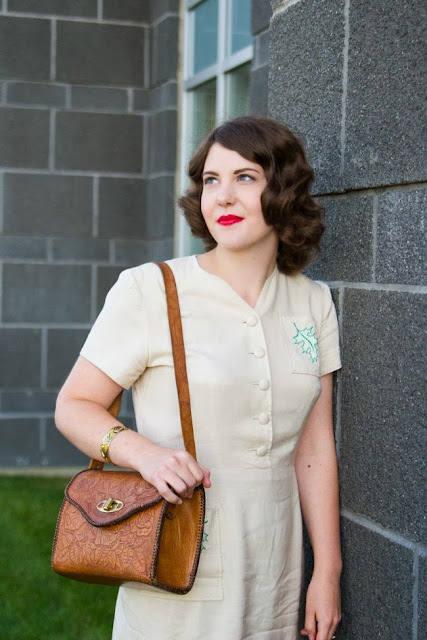 My lovely 1940s dress (as well as my handbag) was a gift from Miss Bee Vintage. It was NOS with tags (I hate being the person to take those off!) and is a Charles Hymen. The tags advertised it as crease-resistant rayon, but I don't think they took a 3-hour road trip into consideration before making those claims. 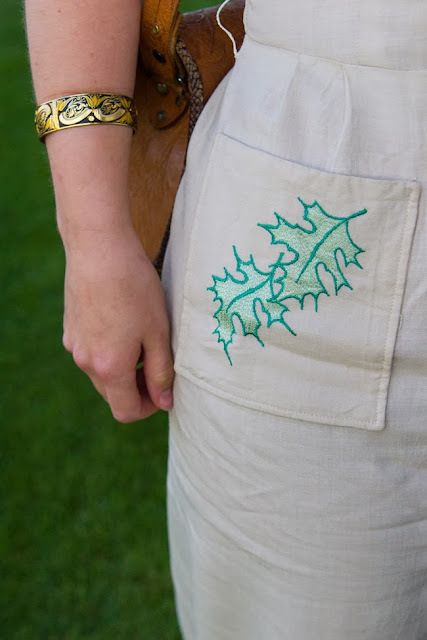 I love the little leaf details on the pockets! 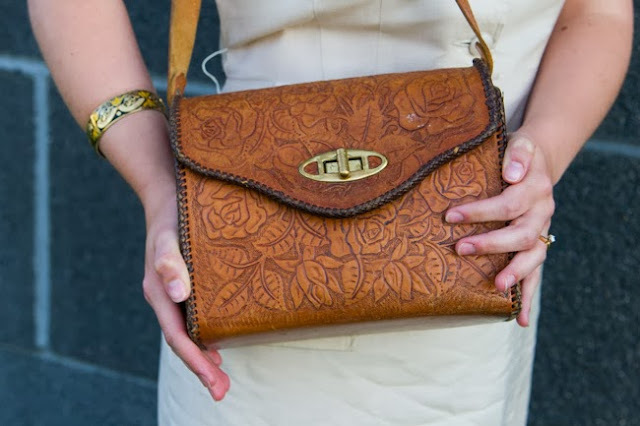 So great for fall and spring. 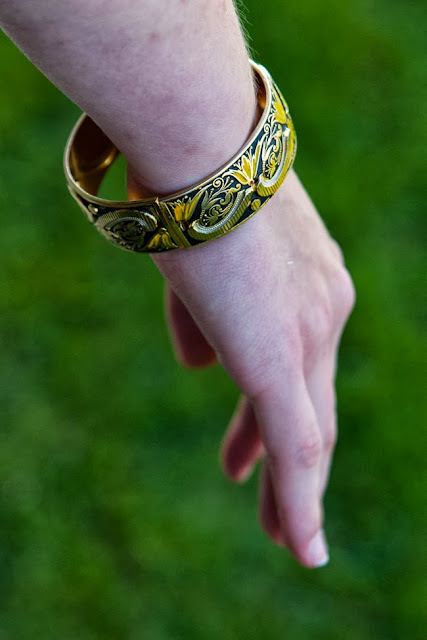 Jessica also gifted me a lovely vintage handkerchief, a beautiful bracelet and earrings that she handmade for me! Be sure to keep an eye out for them in future posts. Thanks again to Tony and Jessica for such a wonderful day. I hope to visit them in the beautiful Okanagan soon! You both look great and your dress is so pretty! Fun!!!! Sounds like you guys had a great time. You both look wonderful! Yay! Glad you had fun. I read about your meetup on Jessica's blog. She's such a sweetie. I love both of your outfits.